This year I have made no resolutions. I am however embarking on a new challenge. I have taken inspiration from the ‘Live Below the Line’ challenge. 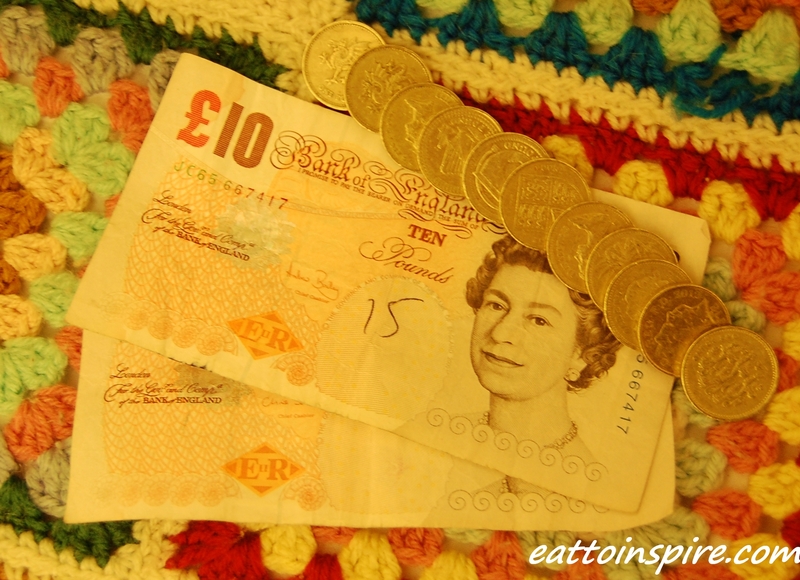 This month I am going to try to eat for just £1 a day. For the entire month of January. I shall be blogging my trials and tribulations of my pound a day challenge to share with you lovely people. Yup, so there it is. My food budget, not for a day, nor a week… oh yes! This is my budget for the entire month of January. Today I have spent zero money on food so my pound for today shall roll over to tomorrow. Last night I went to my friend’s epic NYE party so for breakfast this morning I had some leftover vegan banana bread, for lunch I made a huge bowl of pasta and for dinner I had an out of date flatbread from work topped with tomato, herbs and onions for a delicious pizza style dinner. I am now currently munching on a couple of very ripe freebee bananas that I also got from work and a giant mug of yogi choco tea. I do have the advantage of working in a lovely organic food shop, so I get to take home lots of out of date goodies, soggy vegetables and bruised fruit. Winning 😉 I also have the advantage of a free lunch on my days when I am at work. I am not going to lie to you guys, I am still pretty hungover from last night so I shall keep this short. I shall write a more concise post tomorrow about my reasons for doing the £1 a day challenge, a cupboard itinerary and how I plan on living below the line as it were. If any of you lovely people would like to join me on this challenge just give me a shout.